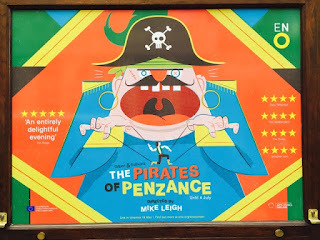 Last week Stuart and I went to see Mike Leigh's ENO production of Gilbert and Sullivan's The Pirates Of Penzance at the London Coliseum in London's glitzy West End. Back when I was a school child I was in our school production of TPoP playing one of Major-General's daughters - it was an all-boys school so we had to play the girls' parts too dontchaknow? Hearing the jolly tunes brought back so many memories and I was singing and tapping my feet along to every note. Much to the annoyance of my neighbouring patrons no doubt. The plot is silly of course with pirates and maidens and policemen and duty but then it is a parody. The production was fine. But no more than that. The set did little and was sparing. 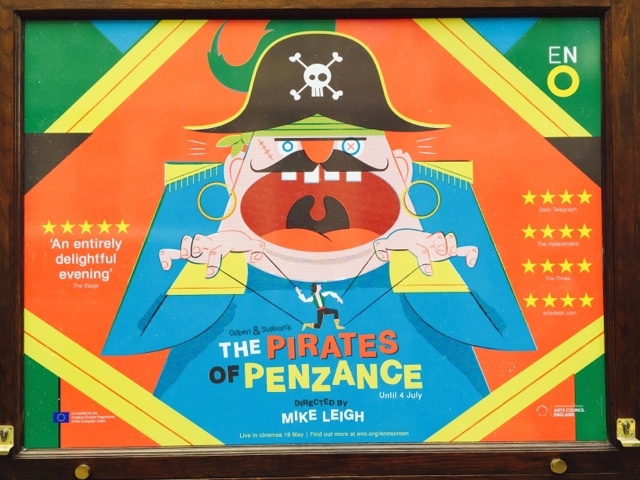 But the performances were wonderful though - laugh-out-loud funny, joyous and tuneful. High points for me were:- Climbing Over Rocky Mountain, How Beautifully Blue The Sky, Away, Away! My Heart's On Fire!, With Cat-like Tread Upon Our Prey We Steal, Poor Wandering Ones! and of course I Am The Very Model Of A Modern Major-General.